Jan Vermeer Van Delft (1632-1675) was a Dutch painter who pertained to the Golden Age of Dutch Art. The only information that we have nowadays about Vermeer’s life come from legal documents (debts and sales), births, baptisms and marriages. In 1653 he joined the Guild of Saint Luke as a painter and began to work as a professional artist. Although he did not make a living from his paintings (he only painted around 35 paintings), it seems that he had a patron called Pieter van Ruijven to which he sold his paintings. Regarding the main themes that he portrayed in his paintings, they were mostly domestic interiors. The most of Vermeer’s paintings are portraits (usually women who are writing letters, playing musical instruments or doing some domestic activity) with the exception of two cityscapes (The little street and View of Delft). Mistress and Maid was painted circa 1666-1667 in oil canvas and nowadays it is located in The Frick Collection Museum in New York. The general overview of the picture shows the figures of two women which is emphasized by the dark background. It seems that the mistress is writing something at the table and suddenly she is interrupted by her maid who is handing a letter to her. The painting’s interest lays on the letter that has just arrived and the mistress’ inner-thoughts. The canvas appears to be well conserved and the main colors that are employed in the composition is a color scheme of yellow, blue, white, light gray and earth colors (umber and ochre). The main technique that Vermeer used to apply the colors in the painting is known as pointille. That is, “producing transparent colors by applying paint to the canvas in loosely granular layers”. Besides, he was considered to be an early artist who made use of the extremely expensive pigment lapis lazuli or natural ultramarine. 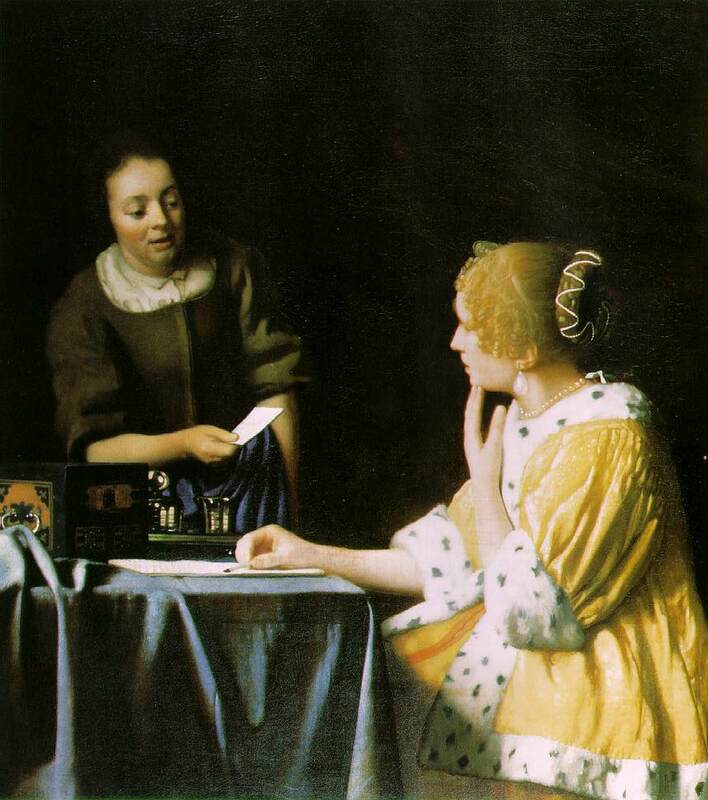 In this painting, Vermeer played with yellow and blue colors which led to a clear contrast. The yellow color illuminates the mistress’ jacket and plays with the light of the scene. Comparing both yellow and blue, it can be observed that a strong contrast is present between them. Moreover, the usage of yellow for the jacket underlines the importance of the m ain figure in the painting, that is, the mistress. In short, the blue provides a visual contrast to the yellow of the jacket. 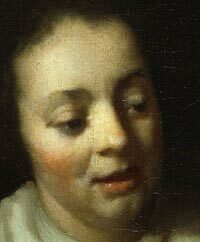 The ochre and umber color tonalities were very much used in Vermeer’s works and this painting is a clea r example of it. The employment of this colors can be observed in the box and its visual effect turns to be a point of light in the picture. Apart from this, the white color plays an important role in the painting. The color of the letter that the maid hands in to her mistress is of a bright white color. This underlines the importance of the letter and makes the observer put his eye on the letter and realize how important it is. Finally, it can be hardly appreciated the presence of light gray in the letter that the mistress was writing before being interrupted by her maid. Indeed, there is a clear evidence of some written illegible lines in the piece of paper. There are some anomalies that can be observed in this painting. First of all, it is worth mentioning that the figures are exceptionally large-scaled if they are compared to other Vermeer’s paintings. Indeed, these figures , together with the ones in the painting titled The Procuress, are the largest figures ever painted by Vermeer. Another technical anomaly that is important to mention is the dark background of the painting. This technique was used from Leonardo Da Vinci onwards and it was used in order to portray isolate figures and to make the three dimensional effect more effective and obvious. However, focusing on the dark backgroun d there can be seen some diagonal shifts which strongly indicate that probably a large-pulled back curtain was present. Thus, the dark background of the picture can be considered to be the result of new experimentation. The light of the painting does not come from an open window as it has been already seen in some other paintings, such as Woman reading a letter by an open window or Young woman with a water pitcher. In this case, it seems that light is flooding over the seated mistress. That is, the main source of light in the picture is present in the mistress’ jacket. Regarding the two figures that are the main protagonists in this painting, there are many characteristics with are worth mentioning. 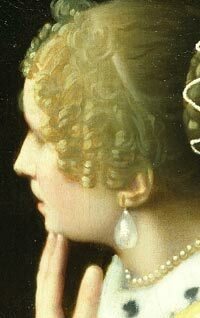 Looking at the mistress, there are some details which demonstrate that this woman belonged to a high social class. For instance, her fur-trimmed jacket which irradiates richness and was used by high class women when at home in order to protect themselves against the cold winter. Apart from this, her hair is dressed in the latest hair-stile and adorned with pearls which were a symbol of perfection and beauty which undoubtedly elevate the standing of the mistress. Her gesture and face expression indicate that she is surprised about the fact of receiving the unexpected letter. Her features are full of femininity and underline the gentleness with which they have been painted. This woman, as mo st Vermeer’s models, was not identified either. The other main figure that appears in the painting is the mistress’ maid. Comparing both figures it can be easily noticed that the maid’s social status is subordinate. Th is ca n be seen in the maid’s clothes; she wears dark working clothes, that is, the typical maid attire. Moreover, her hair is dressed very plain and it is not either adorned. Concerning the maid’s gesture and posture it can be stated that her expression seems to be neutral, but it can also be interpreted as supportive or even confident role. It seems as if she were supporting her mistress, telling her that she should be not worried about the information that the letter may contain. This is a very logical interpretation since during the 17th century maids where the ones who attended the needs of many aristocratic women at home. They usually knew their mistress’ every secret. Finally, there are some elements which are important to point out and which undoubtedly reflect which were some of the main issues that aristocratic women were concerned with in the 17th century. For example, the letter is the most important element in the composition. Actually, letters were considered to be a sign of communication in those times but only among those who were literate. The appearance of letters in this painting emphasize the importance of privacy which was an issue which was emerging. That is, the emergence of the individual and her inner thoughts. In this painting, there are two letters; one is sealed and the other is being written by the Mistress in the moment in which the maid interrupts her with the sealed letter. The inner thoughs that the just arrived letter produces in the mistress’ mind can be seen reflected in the expression of her face. Thus, the observer feels curious about the letter; is it a love letter? Is it a refusal? That is something that the observer is not able to know since the sealed letter keeps the mystery of the painting running. Good list of references and good review. The Thumb cannot exist on Catharina’s hand in the large picture, Lady with her maid. IT IS A KNUCKLE-LENGTH TOO LONG.Vermeer has to be said to be a bad painter of hands , or he did it for a purpose. That purpose must have been a bawdy joke for his friends/family, which would indcate a sense of humour, whether we appreciate the gross allusion or not! The red double stripe separating in her lap against the yellow skirt is a sensual element. This may refer to the red edging on Vermeer’s Geographer (Self-portrait?) painted at the same time in his carrer. The compasses, as the geographer’s measuring tool for maps may be measuring, surreptitiously, with the same allusion as the thumb in this present work. The hand with the compasses is known to have been repainted from a position above the table. These evidences are disillusioning and difficult to accept, but if true, as I surmise, are very telling about the conversations between painters and possible relationships of subjects within the paintings. 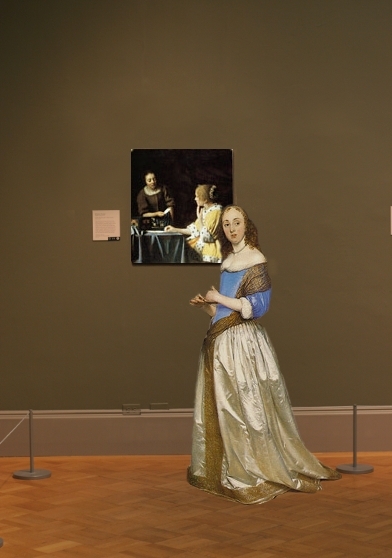 Knowing what we do about the good character of Catharina and her mother, Maria Thins, is it even possible to imagine that Maria, having shared the household with the Vermeer’s and their social milieu, would have allowed herself to be painted, to be seen by her granddaughters, as her daughter’s maid in this fiction? She is not the maid of other pictures. No! No, it could never be! Really?